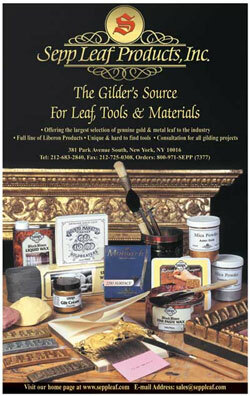 The gilder's source for leaf, supplies, tools and materials. Welcome to a world of superior finishes. 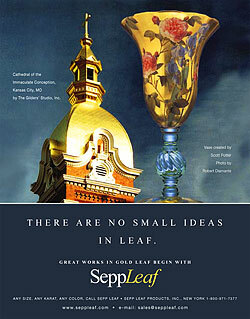 Sepp Leaf Products is the industry source for the widest selection of genuine gold, silver, palladium, metal leaf and supplies. We search the world's finest goldbeating houses to bring you an unparalleled variety of exquisitely made leaf in many forms. We offer an incredible range of traditional karats and weights of silver, gold and palladium leaf, used for centuries in the world of design and decoration. Now, we are pleased to offer these products for use in conservation, preservation and new design concepts. We work closely with designers, specifiers and contractors to help achieve finishes that preserve historic surfaces and create a stunning new aesthetic. Gold leaf lends its beauty to virtually any surface: interior and exterior architecture, fine art, picture framing, decorative art, wallcovering, furniture, signage, and glass. Unlock the secrets of an ancient tradition. 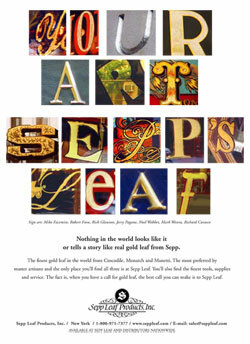 Sepp leaf offers a comprehensive range of leaf in a multitude of patterns, colors and textures. Ribbon leaf provides a rigorous grid or swath of color, loose and patent squares create a hand-done, organic look, schaibin and tamisé flakes provide exuberant and artistic patterns. A variety of gilding adhesive systems help create different levels of sheen: muted, matte, high gloss and burnished brilliance. Sepp Leaf's dedicated staff provides the technical expertise you need, along with impeccable service. We guide you though every step of the process: sourcing of materials and artisans, specifications, supply and follow up. We welcome the opportunity to assist you in planning your gilding project, and helping to ensure a brilliant crown to your artistic achievement.